Pin-Up Pastries has been open for about three months now, selling whoopie pies, cupcakes, cake-pops and other desserts at events all over the state. It will be one of the half-dozen or so food trucks at next week’s Tucson Food-Truck Roundup, and will hopefully have a semi-permanent location in Tucson in the coming months. I was standing in the morning sunlight admiring the truck when owner Tracey Santa Cruz came flying out the door of Mercado San Agustin, where she does her baking, with a stick of butter in one hand. 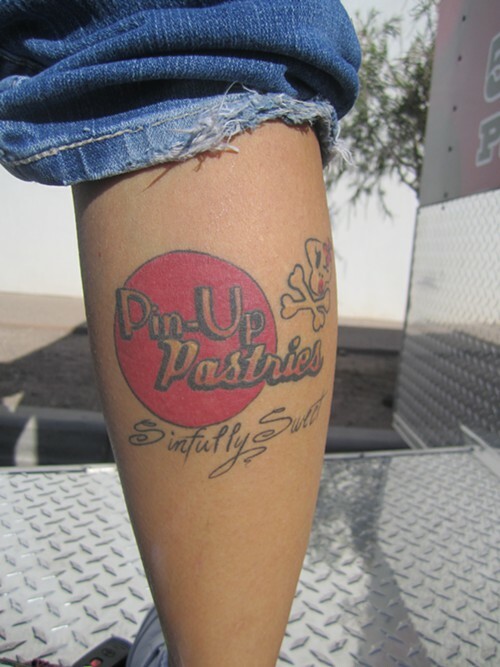 Twenty minutes later she was standing on the bumper of the truck so I could see her Pin-Up Pastries tattoo while explaining the line of paletas she may soon debut. Santa Cruz makes whoopie pies in flavors ranging from salt-caramel to toasted-coconut, with standard and seasonal flavors available as well. Sometimes she sells cookies and brownies, but she tries to stick with unique offerings people can't find elsewhere. Tom Duncan of Whiskey Ranch BBQ helped with the design of her truck, and they often work special events together. She says owning the truck has been so much fun that she’d like to open another one that serves food other than desserts, but her lips are sealed on that for the moment. Santa Cruz says her sister and mother have played a huge part in getting the business going, although it took her awhile to hand over a bit of control to them. “I’m a control freak, but I had to learn they could fill a whoopie pie as good as I could,” she says with a smile. Desserts at Pin-Up Pastries are typically $3 each or 2 for $5. You can keep up with the truck here and here.